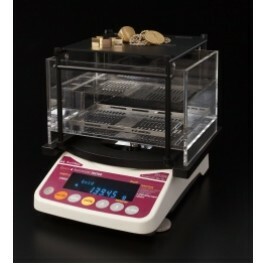 GK series evaluate gold (platinum) by measuring specific gravity (weight in air and weight in water). Easy, quick, accurate, shows Gold K9 to K24 & %(percentage). Popular among Gold trader, buyer, Jewelry shop, Pawn shop, Gold mine, even some banks in some countries. No stain, no scratches, no chemical for testing. 1.GKs can check purity to confirm if marked stamp on gold (platinum) is correct or not. GKs are very useful to check most common type of fake gold: lower purity than marked stamp on gold (platinum). 2.Gold (platinum) which outside covered real gold, and inside with oter metal can be detected. 3.Non-gold (platinum) metals can be distinguished. 4.Can be measured scrap gold at time and show average purity. 5. 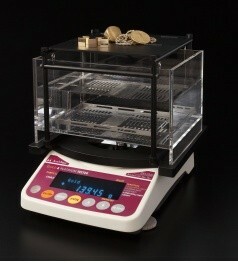 Also function as a normal gram scale and Densimeter. 3.Materials which have close density to gold (platinum). 3. See display for result.